El Camino Del Diablo (The Road of the Devil or The Devils Highway) was the link between the Spanish colonies in Mexico and the ones in California. 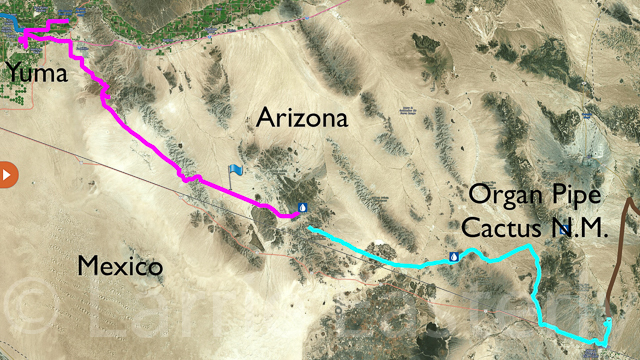 It began in Caborca, Sonora and extended 250 miles through the Sonoran Desert to Yuma, AZ. There is little water along the route and there are many grave sites of those whose timing or supplies were not up to the task. People traveled the route in search of gold, a better life or to trade. Today the 125 mile long section of the route in the U.S. is on the National Historic Register. It runs from Yuma, AZ along the Arizona Mexican border as it traverses the Barry M. Goldwater (bombing) Range, Cabeza Prieta National Wildlife Refuge and the Organ Pipe Cactus National Monument. 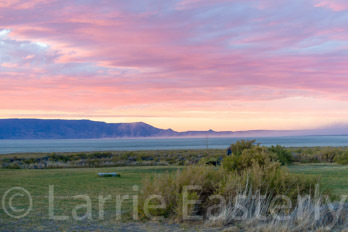 It is one of the remotest and desolate roads in the U.S. 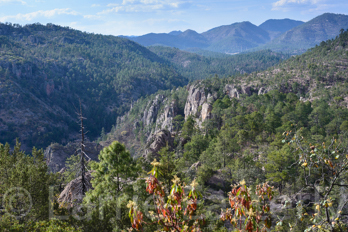 I first became interested in driving El Camino Del Diablo after I signed up for a trip into the Copper Canyon area of the Sierra Madre Mountains in north central Mexico. The trip was scheduled to start in Douglas, AZ on April 21st. Our van was being converted to four wheel drive in Santee, CA and would be ready on April 16th. This left me five days to get from Santee to Douglas. Right now there is a lot of talk about building a 35 to 45 foot tall wall along the US Mexican border. I thought it would be interesting to drive along as much of the border as possible to see the current situation for myself. Looking at different mapping applications and aerial images I saw a road that traveled parallel to the Arizona Mexican border. The members of both The Expedition Portal Forum and the Overland Bound Forum were very helpful and freely shared information about the route. Based on their feedback and my desire to drive the perimeter of the US I worked out a route that ran from Santee, CA to Douglas, AZ as close to the California, Arizona, Mexican border as possible. On Monday April 16th I was on a flight to San Diego to pick up my van. After getting trained on the new 4WD system it was off to the local Walmart to meet my buddy Bruce and to pick up supplies for the trip. From there we headed south to Potrero, CA and our first view of the current border fence. Continuing east we passed acres of irrigated farm land interspersed with acres of solar panels. 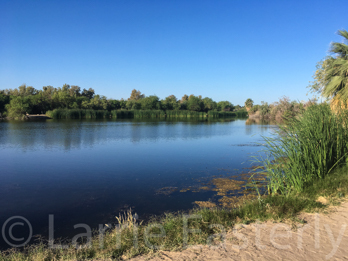 Our first night was spent at a Bureau of Land Management (BLM) campground just east of Yuma near Fortuna, CA. The campground has shaded dispersed sites around a small pond. There were egrets and other birds around the pond. The next morning we headed back to the Marine Corps Air Station Yuma to register and get our permits to travel the Camino Del Diablo. The application has 15 questions that all basically say the same thing, “you are traveling at your own risk and you are the only one responsible for your death.” I found it a somewhat amusing document to read through. It makes the trip sound much more dangerous that it was for us. Once we signed our lives away we were given our permits and a good map of the area we would be traveling through. The map shows that there are several starting points near Interstate 8 for the Camino Del Diablo. All cross the bombing range. We took the first one and, as requested, called into the Marine Base to let them know we were starting. The road surface was a mix of desert sand and gravel. The first part of the trip would take us across the Barry M. Goldwater Range. Created in the 1950’s the Range is used by the military to practice air to ground and air to air live fire exercises. Driving across a bombing range sounds like it might be dangerous but in reality it is not. As the good witch of the north said to Dorothy in the Wizard of Oz, “follow on the yellow brick road.” Stray off the main Camino Del Diablo into closed areas and you may find unexploded ordnance, live fire exercises, military maneuvers, be be in a heap of trouble with the military police and the border patrol. The area on both sides of Camino are closed to all travel and camping. We took the turnoff to La Fortuna Mine. The road surface changed to rock and became very rough, slowing our progress. In 1894 ranchers and part time prospectors pushed some rocks together around their campfire to hold the coffee pot. The next morning they saw what looked like gold had melted out of the rocks. They followed a wash up hill and came to a 20 foot wide vein of rose quartz. 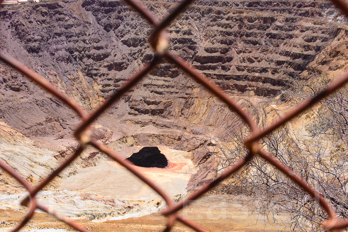 They had discovered Arizona’s most valuable gold mine. The mine was in operation from 1894 to 1904 and yielded 123,000 ounces of gold. After lunch and touring the mine area we headed south, took a wrong turn and came to an emergency beacon. There are several beacons around the area that people can use if they are in desperate need of help. Once activated the U.S. Border Patrol will arrive within an hour. We backtracked to the correct road and continued south where we met several researchers from the Arizona Game and Fish Department. They were on the Range doing mammal research. We asked them about the different passes across the Tinajas Mountains. Of the three they recommended the one farthest south, Tinajas Atlas. They said the second one was really rough and difficult to traverse. Just as they left a Border Patrol officer drove up. We gave him our pass numbers and and talked to him about places to camp. He recommended Tule Well. The other campsite, Papago Well, gets a lot of illegal immigrant traffic at night and can be quite noisy. The route over Tinajas Atlas Pass was scenic. 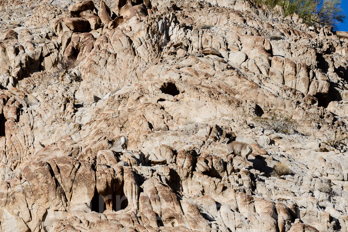 Bighorn sheep crossed the road in front of us and scrambled up the mountain side. We tried to find the natural rock water troughs called High Tanks. 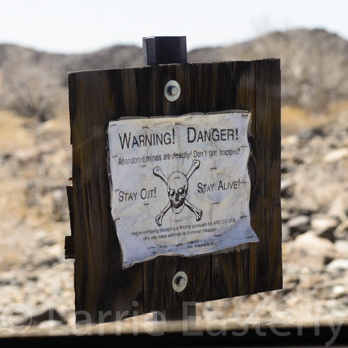 Unfortunately we could not find the trail that led to them so we continued east towards Tule Well on the Cabeza Prieta National Wildlife Refuge. Shortly before reaching the campground a Sonoran Pronghorn Deer crossed the road in front of me. I found out later that this was a rare occurrence as we were outside the pronghorns normal range. 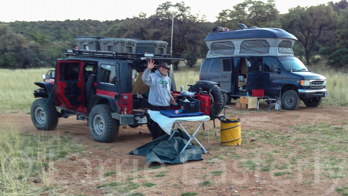 The campground at Tule Well was quite nice with picnic tables, fire pits and grilles. We found a nicely shaded spot and set up camp. Shortly after we setup Jim pulled in. 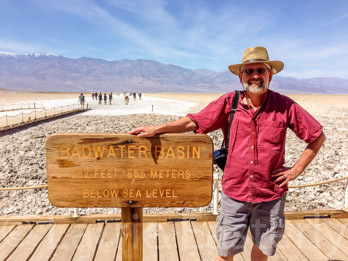 He is a botanist from The University of Arizona who has a research grant to map and compare satellite imagery to the actual flora on the Refuge. He comes out several times a month for a week at a time. He was a wealth of information on the history, geology, flora and fauna of the area. The next morning after checking out the building at Tule Well we continued east stopping at Papago Well for lunch. 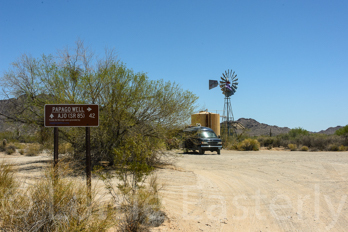 Both Tule and Papago Wells have old style windmills and large water storage tanks. There is a spigot so travelers can get water. We passed a Border Patrol base just west of Organ Pipe Cactus National Monument. We continued into the Monument where we turned south towards the boarder. Then it was a left on to Puerto Blanco Drive that parallels the border fence. We stopped for some photos at the fence. It was a little weird standing next to the border fence. Almost like looking into another world. Just on the other side is Sonoyta with its rundown roads, poor infrastructure and low standard of living. We could see the traffic on Mexico Route 2, the main east west highway in northern Mexico. It carries most of truck traffic from Tijuana to Texas. We continued the few miles to the end of the Camino Del Diablo just north of Lukeville, AZ. We got fuel in Lukeville and then headed north to Oregon Pipe Cactus N.M. where we stopped at the visitors center and then registered at the campground. The campground has a capacity of 248 camping spaces. There were only about 50 campers when we arrived. The hot showers at the campground were a a joy after spending three days in the desert. During those three days we saw the beautiful but desolate landscape that surrounds the Camino Del Diablo. On the was we passed two permanent Border Patrol installations and a couple of temporary observation posts. The Border Patrol officers that we met were all very helpful and friendly. Thus ended our drive along the Camino Del Diablo. It was now time to continue east towards Douglas through the Coronado National Forest. Due to some minor damage to the van and Jeep’s check engine light being on we bypassed Ruby Road went directly to Nogales on pavement. The Ford dealer there had time to fix the van and diagnosed the engine codes on Bruce’s Jeep. 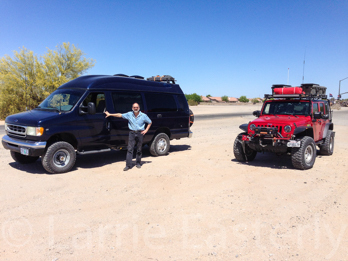 While I waited for them to repair the van Bruce took his Jeep to a muffler shop across the border to get a Mexican solution to his muffler problem. He got back just as my van was finished. After getting fuel we headed east along the border and into the Coronado National Forest on Duquesne Road. We spent the night at a nice dispersed camping site with a view of the San Rafael Ranch Valley. The next morning we crossed into the rolling grassland of the San Rafael Ranch and came across the monument for Fray Marcos De Niza who was the first European west of the rockies to enter Arizona in 1539. We were very close to the border at this point and could see the fence. Bruce turned down a dirt road and shortly came to the fence. 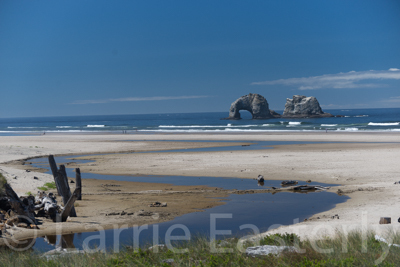 We got out and took photos from both sides of the border. 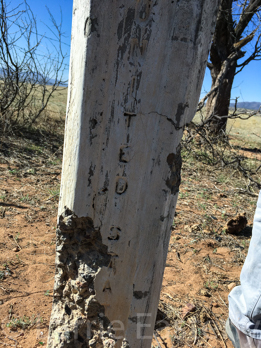 We lucked out and found an original concrete post that marked the border between the U.S. and Mexico. There are a couple of strands of barbwire strung on the current fence to prevent pedestrians from crossing over. 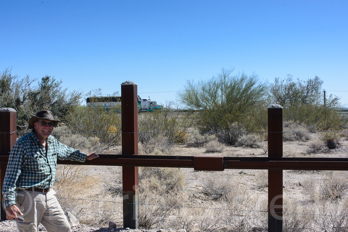 Its main purpose is to prevent vehicles vehicles from crossing the border. This is does very well. A short while after leaving the fence a Border Patrol agent flagged us down and asked if we were just at the border. We said yes. Someone had seen us at the fence and called the B.P. The agent said have a good trip and went on his way. The rolling hills and grassland of the San Rafael Ranch is where the movie Oklahoma was filmed. 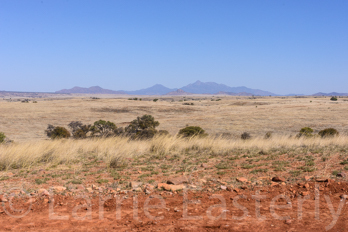 Lots of wide open spaces with not a building, telephone pole or manmade structure to be seen for miles. After crossing the ranch we were back in the Coronado N.F. until we reached the mountain overlook at the western edge of the Coronado National Memorial. The viewpoint at the west edge of the monument is spectacular. We stopped at the visitors center to find out more about Coronado. The Memorial is just west of the San Pedro Valley. It was this valley that Coronado and his 1,500 men, 5,500 sheep, horses, and cattle followed northward into the U.S. in 1540. He was searching for the seven cities of gold. His two year journey of 5,500 miles took him into Arizona, New Mexico, Texas, Oklahoma, and finely to Salina, Kansas. Continuing our trip eastward we headed to the old mining town of Bisbee AZ. We stopped at the Lavender Pit Copper Mine. In operation from 1950 to 1974 the mine produces copper, gold, silver and turquoise. It is one heck of a hole in the ground. The historic old town in Bisbee has narrow streets lots of shops, restaurants and other tourist activities. After Bisbee we continued south to Douglas and the the hotel where we would meet with the rest of the group that was going to Mexico. Even though there was some minor damage to the van I really enjoyed the trip along the border. It gave me a better understanding of the personal, physical, and environmental issues that will come up if the wall is built. I would definitely do it again.